Many of those that have taken up the practice of Falun Dafa have experienced significant health benefits. 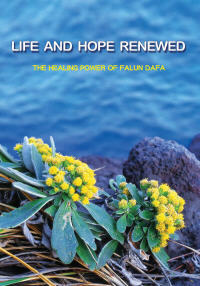 The book Life and Hope Renewed: The Healing Power of Falun Dafa is a collection of remarkable accounts of people being cured of a wide variety of health problems through practicing Falun Gong. These first-hand accounts of miraculous recoveries are but a small sampling of countless such stories. We invite you to read some of these stories to discover for yourself the broad-ranging health benefits that so many people have enjoyed from the practice.